Despite being voted the world’s favourite animal, an international symbol of culture and religion, wild tiger numbers have crashed. Estimates now put the population at 3’159 (approx. 2'500 breeding individuals) over 13 range states. In 1975, tigers were listed in Appendix I of CITES, preventing all commercial international trade. However, this has not stopped domestic trade, where legislation is often weak or non existent. SKINS - Decor and non-financial bribes. BONES - Tonic, 'Wine' and 'Glue', sold as luxury items and in medicines said to cure rheumatism and prolong life. CLAWS AND TEETH - Talismans and Jewellery. LIVE SPECIMENS - Pets, Tiger Farms and 'Visual Feasts'. 5'000 captive tigers reside in zoos, rescue centres and with private owners in the United States. At federal level the U.S. has strong laws banning the trade of tiger parts and derivatives, but of course loopholes exist that could undercut the overall U.S. effort to combat the illegal tiger trade. Agencies do not know at any given time how many tigers actually exist in captivity or have any precise data on what becomes of their carcasses or parts when they die. All the way on the other side of the world, from one superpower to another, the Chinese Government has faced criticism for its conflicting actions and murky domestic trade from the 7'000 (rising by 800 more each year) captive tigers held in dingy tiger farms across the country (as well as other South East Asian countries). There is no domestic ban on tiger skins and even though domestic trade in tiger bones and meat was banned in 1993 you can still find these tiger products sold openly today. Traders operate within the grey area between wildlife protection laws and there is little law enforcement to deter any illegal activity. In fact, pressure on the government to overturn the ban is mounting from business owners, who stand to profit. "The ban is in place but won't be there forever, given the strong voices from tiger farmers, experts and society," warned a deputy director at China's State Forestry Administration. Honored in myth with power and majesty, ironically, it is this that is driving the big cat's extinction. 3'000 years ago Traditional Chinese Medicine practitioners used the species in an array of medicines stemmed from the beast's strengthening abilities. These practices developed over time and became ingrained into Chinese culture, conservation groups and international NGOs fought an uphill battle to change consumer opinion. "Foreigners just don't understand. Chinese people know that tiger is the best medicine in the world. It cures so many things. It makes you strong. It makes a man more virile." Sales manager at the Xiongsen Bear and Tiger Park in Guilin, Xhao Runghui. However, since the 1993 ban, Traditional Medicine Practitioners have negated the use and efficiency of tiger derived remedies, removing them from the Chinese Materia Medica and the Traditional Chinese Medicine College curriculum. The Chinese government itself has conducted public awareness campaigns targeting TCM consumers, putting 'Do Not Buy Tiger Products' labels onto other traditional medicine products and organizing education conferences. Funding was put into research to find substitute medicines, and now alternative calcium sources are promoted to treat bone ailments. 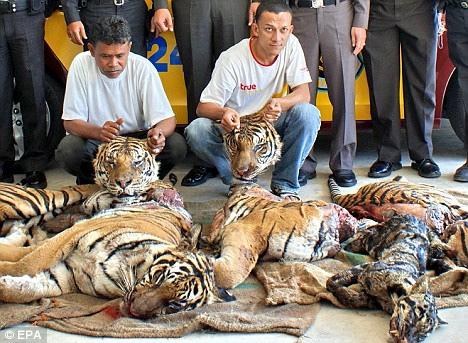 So why the rise in tiger farms? Although misinformation is still circulating, 63% of people in China say they are for tiger farming for conservation purposes. Let it be clear, tiger farming has no conservation purpose or intent. Captive bred tigers do not survive in the wild. Genetically compromised by years of inbreeding they do not posses the skills to hunt in the wild, even if there is suitable habitat for them to be released into. If 7'000 farmed tigers, who have been raised on livestock, were to be released into the wild, they would pose a considerable threat to the surrounding communities. By allowing a legal trade, China is stipulating a demand for tiger products, increasing poaching and the supporting the illicit trade of these fierce wild cats.